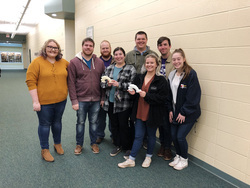 Stephen F. Austin State University education students collaborated with staff members from the Center for Regional Heritage Research and Steen Library to print historical artifacts in 3D. Students utilized these artifacts to build lesson plans and teach at Woden High School. NACOGDOCHES, Texas - History can seem like a difficult subject to learn, but Stephen F. Austin State University secondary education students and staff members in the Center for Regional Heritage Research and Steen Library are using 3D printing to help bring history to life. During the fall semester, students in a sociocultural and historic perspectives in American education course taught by Dr. Amber Wagnon, SFA assistant professor of secondary education and educational leadership, collaborated with staff members from the CRHR and Steen Library to print in 3D bowls from the Caddo Native American tribe and handles from a cannon recovered from wreckage of the La Belle ship of French explorer René-Robert Cavelier, the Sieur de La Salle. Drs. Robert Selden, research associate, and Mark Barringer, director of college research and associate professor in history, helped with the project. Selden discussed the 3D-printing process with the students who then printed other items. "At SFA, 3D printing is a relatively new tool and is an asset we have on our campus," Wagnon said. "It's important for our teacher candidates to think about meaningful ways to utilize technology in the classroom. Teaching is a field in which collaboration is important, and I was excited the students were able to work collaboratively with other groups." After learning the 3D-printing process, education students created lesson plans, which they taught at Woden High School. SFA interdisciplinary studies sophomore Julisa Valdez of Houston said this project taught her patience and how to be flexible in the classroom. "We had a lot of technology problems at first, which was frustrating, but it happens to teachers every day, so the best you can do is be flexible and patient," Valdez said. "Prior to this collaboration, I had only worked with kids in elementary or early middle school, but working with high school students had a different atmosphere. Students were ready to learn and asked a lot of great questions. This experience has made me realize what I could do to become a better teacher." Not only did this project introduce students to new technology, but it also brought them into the field where they gained experience with classroom management, learning theories, diversity, planning and teaching. "I believe we learn through doing. My students want to be educators, and I want to give them the opportunity to start that journey as early as possible," Wagnon said. "I wanted them to have the opportunity to utilize and practice the theoretical tools we spent the semester examining." For more information about SFA's James I. Perkins College of Education, visit coe.sfasu.edu.